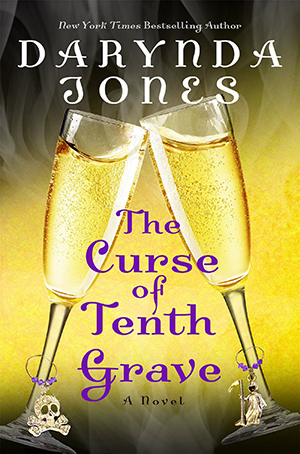 THE CURSE OF THE TENTH GRAVE is the TENTH installment in author Darynda Jones's Charley Davidson series. As the story kicks off, a week has passed since Charley and gang returned from New York where she learned more than a few secrets she's not sharing with anyone, not even Reyes. It has been a tumultuous road for our sarcastic Private Investigator/Full-time Grim Reaper/God from another universe, Charley Davidson. She's mom to Beep, the one who is fated to save the world. She's married to the Son of Satan, Reyes, who is as hot on the outside, as he is on the inside. She's got the very best of friends in Cookie, who I adore along with her daughter Amber. And, Charley has a supporting cast that includes Uncle Bob, Osh, Garrett, Angel, Artemis, Pari, and Rocket who are nearly indispensable to the enjoyment of this series. Whenever you pick up one of Jones's books, you know that Charley is going to have a whole lot going on. Well, that sure doesn't change in this book. From a murder investigation that the ADA wants Charley to solve quickly because that is what she does best and he may or may not be blackmailing her. To a homeless girl who is convinced that she is the next to die. To a powerful God Pendant that can trap someone like Charley in an alternative Hell world. To Gods stalking Beep, and leaving bodies behind, while Michael and his boss Jehovah take it all in. In between, Charley and Reyes are having a bit of a stagnant relationship since they arrived back in Albuquerque. The couple has been through so much over this series, and over the years, that you would dare hope that they could put together all of their secrets into a basket, and reveal them at once so that no hard feelings or misunderstandings happen. I dare say that Charley's secrets are the result of her experience in New York, and how she came about them. There is yet another interesting twist when a video of Charley shows up on YouTube! So, if you haven't read The Dirt on Ninth Grave yet, please do so now. I loved how Cookie gets Charley and Reyes talking again. Who knew! Such a stunning and brutal ending to THE CURSE OF THE TENTH GRAVE. I honestly can say that I loved it! I can't wait until the Eleventh book is released in January 2017 to see what happens next to Charley and gang. I absolutely loved the last chapters. I loved seeing a whole new Charley who isn't afraid of the big bad Michael or his fellow Angels and stands toe to toe with Gods. Especially now that we know Charley's true nature has been uncovered. I loved the entire scene with Beep's army standing shoulder to shoulder with Charley. I loved that Charley finally gets a chance to hold Beep if only for one moment time. It has been a rough time for Charley since she had to give her up to protect her. I continue to read this series because of Charley. I love her witticism, her sarcasm, and the fact that she has come a long way. While she does have some Churlish issues, I can get over them since they all eventually work themselves out. I love that she has such amazing new abilities now that pretty much equal to those of Reyes, maybe even surpasses them. I love this series because of the secondary characters. I shall continue to read this series until the final chapter is released by Jones, and she pulls the curtains back on the final act. Agreed! I loved this too. These books always go out with a bang. Glad we don't have to wait too long between book, though. So glad you loved this, I really did as well and it makes me super excited for book 11! I'm excited for the next one too. This one wasn't my favorite but the ending made up for it. Glad you loved it! I've only read the first but I love when a series can hold up so well. I've now seen several great reviews for this book. Might have to give it a go. I keep seeing this book around everywhere! Still haven't read past book one! Time for a bit of self-berating! I'm waiting on the audio. I can't read the books without Lorelei King in my ears. Glad you loved it though. I'm excited to see how many peoples are enjoying it. OMG, I need to read this series so bad!